Come learn about The Principles of Our World. 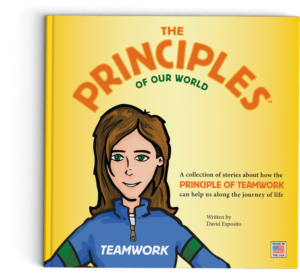 In a series of real-life stories, readers will be introduced to The Principle of Teamwork. The stories in this children’s book are meant to remind all of us about the importance of teamwork in our lives. Enjoy the book in one sitting or read just one story at a time. “Hello, I am The Principle of Teamwork. “People say that I am the reminder they need to work together to accomplish great things. “People also say that I help them feel good about themselves when they are a part of a team—something bigger than themselves. “It is normal that sometimes in life we can feel lonely. But, when we all come together as a team, we can help each other out during the tough times in life. “I like to see people work together as a team in sports and at work. However, my favorite teams are the families at home coming together to help and care for each other. “My parents told me that there is no ‘I’ in team, and that people do their best when they are working together as part of a team to accomplish a goal. “Please call on me when you need some encouragement to be a team player. I can help remind you about how wonderful it is to be a part of a group—something greater than yourself.